Honorable Mention of my Top Ten of 2016. This massive campaign guide clocks in at 356 pages, 1 page front cover, 1 page dedication, 2 pages of editorial, 1 page backer list, 3 pages of ToC, 1 page session sheet (also included as a separate pdf), 2 pages of char sheet (similarly included and form-fillable), 1 page SRD, 1 page back cover, leaving us with343 pages of content, so let’s take a look! Urgh. This took forever. What you’re reading is my 5th attempt at writing this review. No, I am not kidding. 4 times I wrote this and ended up not being happy with the tone, the focus. This is a hard book to review, so please bear with me – I have to digress a bit to properly explain this book. I actually bought the limited print run hardcover version of the book and while I do have the pdf, the hardcover is ultimately what this review is mostly based on. First, let me take you on a brief trip through history. Back in the day when I was pretty much a nobody, the esteemed and absolutely amazing Paco Garcia Jaen “took me in” as a reviewer for GMS magazine. I obviously wanted to know what kind of people I was working with and so I listened to a lot of the cool interviews he conducted. (Seriously, check out GMS magazine!) So, it was there that I stumbled over this small indie RPG publisher who had a brief, approximately 16-page, FREE pdf for a setting called “Rhûne.” I opened it…and my jaw DROPPED. Not only did it have Paizo-level artwork, it also had a massive map by none other than cartography god Jonathan Roberts. Oh, and the writing was simply amazing…the setting was unique in tone and focus. Let me be perfectly honest: I did not expect it to go anywhere. It was amazing and just the creative impulse I love; radically different and creative…and it was the setting of a small, tiny publisher. One man’s vision. I did not believe that we’d ever see this book. When small pdfs began slowly trickling in, I was cautiously optimistic. When the KS for this book blew up like it did, I was positively pleased by my fellow gamers obviously craving something different, by them lending their trust to a small outfit like Storm Bunny Studios. I would have supported it back then, but alas, my precarious situation left me completely broke while the KS ran. When the book actually came, I knew I had to have it and, as providence had seen to, had at this moment the funds to allow me to purchase it. Then the book got stuck in customs big time and was almost sent back…but I digress. What I’m trying to say is that this is exactly what KS is supposed to do: Make visions come true that otherwise would never have seen the light of day in this form. To all backers of this book, I take a bow before you. The book languished on my shelf for a while due to my reviewing duties for my patreons…and then I began reading it, slowly, in increments. So, the first thing you have to know about me in order to understand where I’m coming from, would be that I am enamored with Norse lore and culture; I lived in Norway for quite a while, I speak all Nordic languages, my translations from Icelandic have been published and I have read pretty much a significant portion of the literary canon of all Scandinavian lands. I am proficient in Norse and Old English as well and read the extensive catalogue of sǫgur (plural of sagas, just fyi). I’m the prick who’ll correct assumptions about culture, the guy who complains about translations failing big time to convey the tone of the originals properly, the guy who’ll chew your ear off about the “errors” in the Vikings TV series. My passion for the topic makes me pretty hard to please. Rhûne is not a straight adaptation of the material, but it heavily quotes the themes and leitmotifs of Scandinavian mythology and reappropriates them. Reappropriation would in this context be the process, by which a culturally distinct text (this can include visuals and any form of media), originally distinct for a certain culture, modified and included within the cultural context of mainstream reception – examples would include subculture music aesthetics gaining traction – whether it’d be rock or rap or something more far out. In this process, often wrongly negatively connotated, the respective medium is taken and modified to appeal to a wider demographic, changing, but also evolving at an amplified pace: Without broader acceptance of rock, there would have never been punk…metal…etc. It is a perpetual broadening of focus. Similarly, Rhûne appropriates Norse concepts and employs them in the context of roleplaying games, but unlike many reappropriated forms of media, it stays in the tone and leitmotifs featured, remarkable true to the source material, while at the same time radically mutating it. The key notion here would be “stormpunk”, the term coined for the genre featured in the setting. The analogues of the word to steampunk are pretty evident from the get-go (2 letters difference…), but ultimately, the resulting concept is radically different than any comparable “-punk”-suffix’d setting. In order to properly enunciate why and how, I have to dive a bit into the exact nature of the setting, for, even though I can only talk about the concepts herein in a linear manner, they all are interconnected. As pretty much everyone knows, there is an inherent fatalism, an, pardon the pun, “endzeitgeist” (Zeitgeist of the end-times) inherent in Nordic myth: We all have at least heard about Níðǫggr chewing at Yggdrasill, about Naglfar, the ship of nails, about Ragnarök and the Fimbulvetr; there is a fatalism of acceptance and a promise of, perhaps, a renewal or an inevitable end that suffuses the myths. This concept is inextricably interwoven with Rhûne’s stormpunk aspect. So, what is this stormpunk? Well, the closest analogue would perhaps be to look at the ostensible works of Nicola Tesla and picture what would have happened, if his concept of a freely accessible, immensely powerful electrical energy would have been applied to a Norse cultural context. Instead of explaining an allotopic, quasi-Victorian or Edwardian history wherein steam and coal are king, Rhûne is at the same time feeling more progressive and more archaic, more savage and more advanced. The existence of the stormtech, ultimately, makes the setting closer to our own world (as I’m using copious amounts of electricity to write this review and you’re doing the same, reading it! ), but at the same time, Rhûne’s whole theme is actually more fantastic than comparable “-punk”-settings, at least to our eyes. The reason for this lies in Rhûne understanding, in spite of PFRPG’s alignment system (which I, as you know by now, LOATHE), that a crucial component of Norse life and fascination with literature lies in its unique (from our perspective) morality: We all are conditioned, from an early point in our lives, to read the world in dichotomies, courtesy, among other factors, of the influence of our book-religions. We believe in good and evil, righteous and vile causes, in defined absolutes, in spite of our life experiences often contradicting this. And indeed, if you take a look at the “heroes” (protagonists would perhaps be a better word…) of the classic sǫgur, you’ll see a distinct lack of traditionally heroically coded behavior: Gigantic melancholies and gigantic mirth, the might of the strong and popular – these aspects are counteracted with a surprisingly progressive mindset that is closer to us and our world than we’d usually believe…in fact, reading the old sǫgur, you’ll be reminded more of the writings of relatively modern authors than medieval literature. This duality of the archaic and modern is expertly interwoven with the concept of stormtech and generates a panorama both familiar and alien, sitting, quite literally front and center among the setting’s leitmotifs. You see, instead of the predetermination of traditional myth, it is the mythos of science that represents a central focus for the book: The nations of the world, in order to access the Æssinyr (the deities), in their quest for truth, have created these technological wonders suffusing the world – but they also set the Ragnarök clock in motion. The responses of nations and races towards the scientific advancements ring familiar in many a way: The ælves, original architects of the clockwork gates and immortal while close to their homelands, have resorted to a radical philosophy of luddite proportions, eschewing the technological advancements made, while those ælves that walked alongside their lady Y’Draah to discover the whereabouts of the Æssinyr turned into the forsaken, the clockwork elves, who would then proceed, bereft of their immortality and shunned by nature, to create the race of the automata, sentient constructs that only lately have gained what you’d call free will. The ælves believe, fervently, that progress, stormtech and all those boons it brought to the city states of Vallinor, is responsible for the doomsday approaching and that only by shunning progress, they can hope to halt the inexorably approaching end. On the other side, dwarves, for example believe that only in further technological advancements can lie a form of salvation for the world. One does not have to be a scientist to realize that this mirrors very much our own stances towards technology, though it, like any good fantasy, exacerbates the theme and cloaks it in expertly woven mythology: Instead of the fear of nuclear annihilation, what we see herein is the conscious knowledge of precisely WHEN the world will end – there are only 99 years left and on the timer of the Ragnarök clock and time is running out. Speaking of themes clad in the fantastic that resonate herein: Much like “A Song of Ice and Fire”, this setting very much cloaks modern anxieties and themes in an easily digestible format: In the frigid North, the Fel Horde under the auspice of the Thrall lords amasses to destroy the South – you would not be wrong in realizing the analogue to the White Walkers, but the setting does not simply quote the material here; instead, the mythological resonance of the Fimbulvetr is superimposed on “A Song of Ice and Fire”‘s themes of nuclear anxiety as a means of annihilation: The Northern entropy of a nuclear winter is counteracted by man having the weapon of mass destruction that is the dragons, incarnation of uncontrollable nuclear fire. In fact, I’d argue that Rhûne paints a more diversified picture here by including some notions you would not expect from a fantasy setting, no matter how far out. The thoroughly constructed nature of automata (as opposed to Midgard’s gearforged housing the souls of erstwhile mortals) and their free will, their relation with their creators, ultimately means that the setting also allows for the exploration of classic transhumanist ideas, of the question of free will, of the question of the existence of a soul…and much more. In this aspect, Rhûne is similarly significantly more progressive and open, dare I say “modern” than pretty much all comparable settings I have read. That being said, this modernity is always tinted in a thoroughly compelling manner with the archaic: Raiding, slaving and trading, the whole traditional viking-experience, if you will, is a strong leitmotif for the whole setting – but one that, much like many aspects of the modern and archaic mingling, is not simply accepted: The change of social structure that electrical access brought, the themes of a variant industrial revolution and the social upheavals it engendered are counteracted by the decidedly Old Norse way of life and generate a fusion that is wholly and utterly unique in its repercussions and the detail its ramifications generate. 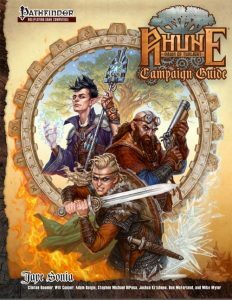 Rhûne exists very much in a wide variety of thematic and ideological areas of tension and as such, it is, more so than any other campaign setting I have read in a long, long time its very own world. Indeed, one can argue that Rhûne, while using PFRPG as a base-line, is not vanilla Pathfinder. This notion of a very defined and concise identity is enforced by the book from the get-go. Instead of taking the anything-goes route, Rhûne instead begins with character creation and talks about what is acceptable for the setting’s tone and why; the world very much makes the generation of characters and themes to be explored a group effort – and I applaud this decision. In a world with so many conflicts and tensions flaring, an internal consistency of an adventuring party is of tantamount importance and personally, I applaud this book for having the guts to say no to the entitlement of universal availability of everything. Indeed, in a setting where the genesis of a race like the jötunfolk has eliminated whole generations with the Burðr Morðvíg in the aftermath of the fall of jötunstones, where ælves tend to view the automata as abominations at best, this is VERY important to retain the consistency of the lavishly crafted and beautifully woven lore of the book. Having a character in Rhûne means picking sides. Both racial and class decisions matter more than in any other d20-based campaign setting I have ever read – and I have read pretty much all (or at least almost all) of them. The book does not simply state this, but instead guides the group through the process in a detailed and unique manner that I really wished more settings employed. For the aficionados of Norse themes, it should also be noted that the FuÞark matters – everyone is born under a rune and that provides intrinsic benefits to the character in question. In a world where the conflict of good vs. evil takes a backseat, one indebted to the morality of the old sǫgur, it is similarly important to note the vast impact of honor, the insertion of which is supplemented with various different ways of tackling it in different complexities: Whether you just want to use it to determine starting attitudes, whether you tie it to areas, whether you include racial tensions – the choice, in spite of the structuring themes of the setting, is ultimately yours and can range from hand-waving to simulationalist level of detail – and yes, if you’re using Ultimate Campaign, there are some differences which are explained in sidebars, allowing you to decide on your own. One of the, at least in my opinions, best aspects of Rhûne from an engine point of view, would be how it treats the determinism that suffuses Norse myth and flips it: The concept used for this purpose is wyrd and it ties in with destinies, governed by, bingo, runes. So, as you may know, the Norse mythology and its concept of fate is very determinist, norns and all. At the same time, this obviously clashes with the more progressive aspects of the Rhûne setting. The solution is interesting, to say the least. While fate does play a roll, a significant one as both a roleplaying catalyst and from a crunch perspective, the existence of the spider-themed shapechangers aryandai and the goddess Velluna-Akka adds a very distinct spin on the concept. More important still would be the tremendous influence of wyrd upon actual gameplay. Each character begins play with 1d3 wyrd points and some feats and special tricks (weavings) can later be learned and used to further manipulate fate. Wyrd points act basically as hero points on speed, with significantly enhanced options on how and when they can be used – including defying death, rolling a d20 twice and helping allies. This is relevant because wyrd is actually an extremely important balancing mechanism: If you’re familiar with my coverage of Rhûne supplements, you may recall me bashing the automata race as overpowered for most settings. You will also recall me complaining about models (subtypes of the race) being made for specific purposes. Within the context of Rhûne, this surprisingly works. For one, the purpose of the respective builds opens interesting venues for the exploration of concepts of free will: I am built that way, do I have to be that way? Secondly, and more importantly, automata are balanced by the mistrust they encounter, their place in the social hierarchy and the fact that they do not get access to wyrd. At all. This should be taken as just one aspect that makes the min-maxier components of the races featured herein work for me; the races are so deeply entrenched within the narrative context of the world and its dichotomous ideologies and areas of tension that, by being pretty ingenious entwined in everything, result in the playing of such a race in Rhûne actually working without breaking the game. I need to reiterate this: Rhûne is not vanilla-Pathfinder. This is also represented in the copious amounts of crunch that supplement this tome, which range from traits to feats and more. Some of these are powerful, some of them are aligned with factions…and all are in service of the greater picture. Damage increases to bows make sense when guns and the like are wide-spread. The massive campaign setting also contains several hybrid classes: The blood skald (bard + magus), the clockwork adept (cleric + wizard), the gjallarhorn (summoner + bard), the gun-priest (previously released as a stand-alone), the juggernaut of blind fury, a barbarian/antipaladin crossover, and the antipala/alchemist plague bringer. These have in common that they generally are high concept and feel distinct; they are more than just a smashing together of mechanics, though, universally, they also have in common that they could have used some further differentiation as far as I’m concerned. And yes, the anti-pala guys represent servants of the thrall lords, so if you don’t want to go into the morality question too deep, well, then this ought to provide enough of a good vs. evil angle. Now, the world of Midgard, the prime material plane of Rhûne, is depicted in absolutely exquisite detail , with names for the phases of the moon by month, holidays galore, languages all receiving their due (and rules for regional dialects if you’re like me and have the kneejerk reflex to roll your eyes at common…). If you#re looking for information on trade, you’ll find it here; if you and your group consider that aspect tedious, you can ignore it: One of the central plusses of the setting is that it knows which rules to use for balancing and world-building and which to render optional. Beyond a massive chronology of the world (as the clock’s counting down) to the respective city states and realms, which feature their own crests, statblocks and more, the whole section is amazing and oozes flavor from every sentence: From fertility festivals to adventure hooks and story seeds, this chapter can’t leave even the most burnt-out of GMs uninspired. Speaking of story seeds: Throughout the book, there is a metric ton of those, allowing GMs and players alike to take up the threads left so tantalizingly dangling. Oh, and yes, Rhûne does not feature a heliocentric cosmology – instead, it is basically a massive cylinder, the trunk of the world tree; a blending of the immediacy of Ragnarok, superstition and the knowledge of planar peculiarities thus makes the world partially unexplored (after all, you don’t want to fall off the world’s edge, right?) – still, this allows an enterprising GM to add her own continents and geography to the setting, while still maintaining Rhûne’s very precise focus. Planar travel is rare and special and as such, the respective planes depicted also differ from the standard, putting, as we’ve come to expect by now, a unique spin on Norse mythology. Here, additional, planar races like the ice æleves of Niflæheim or the Hárálfr, infused with the power of old gods, allow for further diversification if a given group is not content with the base races. Now, I could go through the respective write-ups here, but this review already is very long, so let’s return to the stormpunk aspect. Which is, from a designer’s perspective, more difficult than it first seems. After all, we all know electricity. We learn how it works in school. It is the very motor of our world…so how do you introduce it into a fantasy setting sans breaking immersion left and right, sans killing a gazillion of premises of prepackaged adventures? Simple. There is no alternating current, which means that its copious boons are basically limited to the vicinity of dragon towers, which generate an ambient field that powers the devices and allows for charging. This is genius on a meta-point, for it taps into our fantasies of Tesla’s wirelessly transported energy, while at the same time eliminating the real discovery of alternating current, making the whole system at once plausible and thoroughly fantastic. As an aside, it also taps into the leitmotifs of the archaic versus the modern, of civilization versus barbarism (hence the Howard quote earlier in the review). The storm shepherd cleric archetype would be a badass Tesla-style cleric, a caste of guardians of these towers. From prosthetic limbs to abomination hybrids of technology and magic, the leitmotifs of progress vs. nature, of science vs. the ways of old, tie in perfectly with this conceptualization of a world…and points of light gameplay makes sense as well: Beyond the reach of comfortable electricity, the wild, the savage, still looms. Firearms that can be charged or deliver blast shots, special ammunitions, grenades, munitions carved from the dreaded jötunstone…the sense of plausible fantasy realism applied to every component of this book makes it feel perfectly unified, like this exceedingly intricate and beautiful clockwork. Indeed, the glorious incantation mechanics first introduced way back by Zombie Sky Press also sees use here among numerous new spells, a metric ton of equipment, bloodlines, mysteries, the aforementioned weavings…and the rune-engine. This system is amazing and I’ve covered it before, so I won’t bore you with repeating it. The system’s consistency is to be truly applauded, for whenever I found a big logic bug, some sidebar, some explanation, shows up that makes *SENSE*. Ina book this familiar, yet alien, this attention to detail and mastery in world-building is a truly phenomenal feat to behold. Now, if you expected a cut-copy-paste of the Norse gods and their myths…you’ll be surprised to hear that Rhûne has its very own pantheon, depicted in lavish prose completely with core aphorisms and all. It should be noted that these beings do employ the themes of the Norse mythology, but also, much like the setting, put a creative and enticing spin on the subject matter, one I can’t really hope to properly convey here. Beyond these obviously divine allegiances, a whole chapter is devoted to the diverse and creative factions that shape and govern the politics of Rhûne, drawing further lines in sand and snow, both proverbially and figuratively, adding even more potential, even more narrative potential to the whole array. The emphasis on thematic consistency is not lost even within the bestiary, which not only provides a wide array of unique creatures, all of which have AT LEAST one unique ability to set them apart, but also in the guidance a GM can expect regarding the roles of creatures in the setting. Oh, and yes, the critters ALL have absolutely gorgeous artworks. Rhûne adheres to a two-column full-color standard, Layout-wise, and is so beautiful it almost hurts. The book is littered with a metric ton of absolutely phenomenal, original pieces of artwork, rivaling the density of Kobold Press’ huge books. This can stand side by side with Paizo and WotC-offerings regarding its sheer beauty. It is one of the aesthetically most pleasing 3pp-books I have ever read. The pdf comes with copious, nested bookmarks for easy navigation and the hardcover…oh DAMN. Get it, if you can. It’s a beauty. And here, my seemingly never-ending praise screeches to a grinding halt. There is the reason why I have deleted and rewrote this review so often. Editing and formatting. Oh boy. I’m sorry, but I can’t call them “okay” anymore. There are formatting hiccups and inconsistencies. There are missing verbs, smack in the middle of paragraphs that carried me right into Rhûne, only to have me crash back to earth as I tried to find out what the hell was missing from that sentence. The very header of the jötunfolk misspells them as jotünfolk. There are whole sections which get bonus types right, only to have an ability lack it. There are, in short, a lot of glitches. Now, granted, they *usually* do not tarnish the mechanics too much, but they extend to all aspects. Close reading this book was an exercise in reviewer-frustration for me. It is, quite frankly my opinion that, if this had been penned by anything short of its cadre of veteran authors (Jaye Sonia, Cltin Boomer, Will Cooper, Adam Daigle, Stephen Michael DiPesa, Joshua Kitchens, Ben McFarland, Mike Myler), this would have turned into a full-blown train wreck. The skill and experience of the authors thankfully means that, for the most part, this whirs smoothly like the gears of the Ragnarök clock. At the same time, the glitches hurt me more than in any other book of my reviewer career BECAUSE the book and world are that cool. I am more torn than ever before in my life on a final verdict and after reading my rambling praise of this book, you’ll only have the slightest inkling of an idea why. You see, if I were to rate this on the merit of its crunch alone, including the glitches etc., this would probably receive a 3 star-rating at best. In fact, that’s what the cold, hard review-bot in me would gravitate to. He keeps shouting from the back of my mind that the hybrid classes don’t live up their potential, that component xyz needs streamlining. However, I am, like you, of flesh and blood. I can feel passion and get excited…and this book is NOT a crunch-book in the traditional sense. It is a campaign setting – a depiction of a world that is so internally consistent in its vision, so fantastic and, dare I say it, innovative, I can’t help but absolutely adore it with every hot-blooded fiber of my being. Yes, Rhûne ticks off pretty much all of my no-go-boxes regarding races…but still somehow makes them work for me. This book oozes the passion of some of the industries finest minds and it shows in every chapter, as a cornucopia of creativity is present, nay, immediately evident on every single page. You can flip open the book at pretty much every single page that is not a 2-color chapter-intro-spread of art and find one thing, at least, that is cool and inspiring. Would I play those hybrid classes in another setting? No. Would I play them in Rhûne…yes, I actually might. Because they signify more than just the collective of their abilities. They *mean* something; their very existence puts them in the context of the world and its beautiful tapestry of agendas and strife, of heroism and dastardly deeds. Rhûne reads, most of the time, like the best of world-building novels; Rhûne manages to make me like content I’d otherwise…well, wouldn’t – all by virtue of its phenomenal vision and the extraordinary precision and care that obviously went into this book. I love this book. I really, really do. Rhûne is one of my favorite settings OF ALL TIME. There, I said it. Where exactly in my hierarchy it’ll end depends on the future support released for it…but yes. This is a true campaign setting in the best of ways. That being said, even if you de-emphasize the importance of crunch and choose to focus on the task of the campaign setting to make a world shine, the matter of fact remains that editing and formatting of this book simply does not do it justice. If this did not have all of its hiccups (or at least, significantly less), you’d be looking at perhaps my number 1 for the Top Ten of 2016 here. I love this book that much. However, with the copious glitches that haunt this book, I have to put that in perspective. As far as I’m concerned, this is a masterpiece; an amazing feat by authors and publisher; but it is a masterpiece with flaws. If you go into this book for the crunch alone, or to scavenge material, chances are, you’ll leave disappointed. Unlike e.g. Thunderscape (which works perfectly for that purpose), Rhûne is a work of art that does not reveal its beauty by looking at parts. The only way to appreciate this truly is to look at the big picture, at the totality of material, which is, for once, infinitely greater than the sum of its parts. I could make a case against this book. I could tear it a new derrière and I can see that, for some out there, this will do absolutely nothing. At the same time, if you’re like me, you can work with the book; replace some components with bits from your own library; curse at the hiccups, yes, but every time, unavoidably, you’ll take the book back up and continue reading. Because Rhûne is a wonderful world. Because it dares to be different. Because it dares to make sense. And because it is greater than any words I could use to describe it. Review-bot Endy hates this. As a person, I love it. As a crunch-book alone, you may want to steer clear…but if you really are interested in a unique, creative campaign setting that truly feels different, if you want to support a truly fantastic and innovative book, if you want to send a sign that we want choice and more than the umpteenth variation of classic fantasy, that we deserve unique themes and consistency…then this is for you and will set your mind ablaze as it has mine. The flaws weigh heavily on this one…and frankly, even with the above mindset, I should rate this 4 stars…but I don’t want to. I can’t. The dilemma is that the book does not deserve to be rated as only good. But technically, it also doesn’t deserve being praised this much. I can’t rate this in a way that will satisfy me and everyone out there. It’s just not possible. In the end, there is only one rating that, after much deliberation, I can really live with. This rating would be 4.5 stars (Rated as a campaign setting, taken the flaws into account, representing that it is not perfect), but rounded up (since “good” does not begin to express how much I like this), with my seal of approval added for good measure. And since my top ten of any given year is a deeply personal opinion-thing, it’ll feature as a candidate as well…though it has lost the chance of scoring highly on that list. You can get this gem here on OBS!